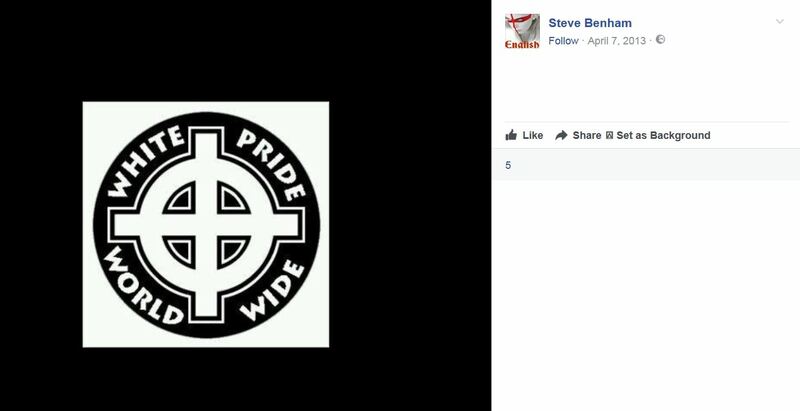 Steven William Benham, 46, of Shirley Towers, Southampton, pleaded guilty to racially abusing and threatening a woman. He was fined £150. Ordered to pay £30 and costs of £85. A right-wing supporter who became involved in a bust-up with rival left-wingers at Maidstone Services has today been jailed for three years. Callum Lambe, 27, was in a coach load of activists heading to demonstrations in Dover when they pulled in at Junction 8 of the M20. Within minutes, coaches carrying other demonstrators arrived and the two groups began a pitch battle in front of terrified diners and service staff, Canterbury Crown Court heard. Lambe, from London, was seen using a hammer which he had grabbed from an emergency panel, to smash every window in a rival coach. Lambe, who admitted violent disorder, was jailed for three years after he appeared by prison video link from Elmley. 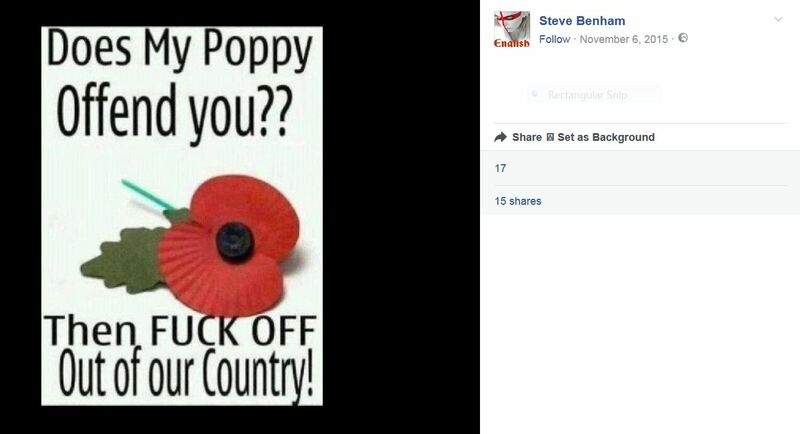 It was later revealed how he has previous convictions for racially aggravated assaults and possessing parts of a firearm and was jailed in 2010 for five years. Prosecutor Paul Valder said: “Five coaches carrying left wingers arrived at the service station followed by coaches with right-wingers, including the defendant. The court heard how 40 protesters then took part in a pitch battle, picking up paving slabs, smashing them into smaller pieces to use as missiles. Mr Valder added: “These were then hurled from one side to the other, along with bins and punches were exchanged – not only in the car park but also inside the services . The prosecutor said the manager then saw Lambe go up to a coach, armed with a red hammer which he used to shatter “every single screen” of one of the coaches, costing an estimated £16,000 to replace. Mr Valder said that another protester, armed with a stick, carried on attacking the coach and threatening the driver. The court heard how police later found the hammer dumped in a bin – and traced Lambe through DNA. Mr Valder said Lambe had received a head injury during the fight – caused by broken glass. 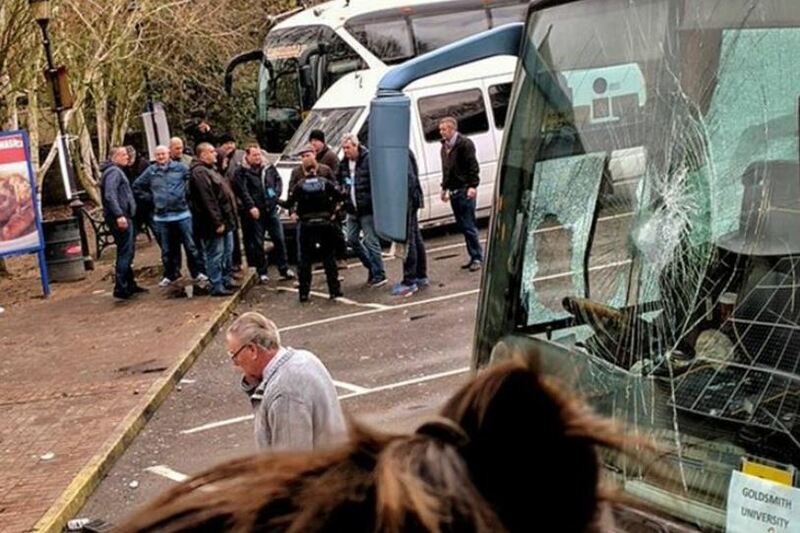 Adrian Crossley, defending, said Lambe had paid £20 to travel to Dover for the demonstrations in January but then discovered the coach was full of “50-year-olds, mainly skinheads”. In another case Thomas Fereday, 28, from Newport in Wales was jailed for 16 months after admitting violent disorder. The court heard how he was spotted throwing stones during the fighting. An unemployed man has been sentenced to a year in jail for a racially aggravated attack at Clapham South station. Callum Lambe, 21, of Loughborough Junction, was sentenced at Southwark Crown Court for the attack on October 17, 2009, when he forced open the gates to the station shortly after 3am, seemingly wanting to buy a ticket. The station cleaner believed he had been drinking and asked him to leave but he refused. After witnessing what was happening on CCTV the nighttime supervisor made an announcement for Lambe to leave, but the thug grabbed the cleaner by the neck, pushing him backwards, and was heard making racist remarks towards him. When removed by police Lambe continued to racially abuse the cleaner and spat in the supervisor’s face. During a struggle he sustained a cut hand and headbutted the supervisor. Lambe was sent to St Thomas’ Hospital because of the cut, but was refused treatment when he turned aggressive and chanted anti-black slogans. He was taken to Kennington police station and charged with racially aggravated assault. Aidan Harris, manager of London Underground’s workplace violence unit, said: “This was an appalling act of violence and racist abuse against our staff. BTP Detective Chief Inspector Kate Shaw described Lambe’s actions as “disgraceful”. In court Lambe was found guilty of racially aggravated assault, spitting at the supervisor, and causing racially aggravated harassment, alarm and distress at St Thomas’ Hospital. A PIZZA delivery driver was horrificially attacked and racially abused during a “mob attack” after being lured to a West Yorkshire pub. Leeds Crown Court heard up to 30 people looked on as the 31-year-old victim suffered a broken jaw and cheekbone as he was repeatedly punched and kicked. The court heard a number of people were involved in the violence and others ignored the injured man’s pleas for help when he begged them to call police. One man, Simon Lawrie, 31, came out of the pub and shouted abuse before hitting the man as he lay injured over a wall. He lost consciousness from the blow. Richard Walters, prosecuting, said the victim had been called to deliver food to the Chequerfield Pub, Pontefract, at around 7.30pm on May 15 last year. When he arrived outside two men began to punch him repeatedly. He was then dragged from his car and held as more punches were thrown at his face. Mr Walters said a woman came out of the pub and asked the two attackers why it was taking so long to kill the victim and shouted more racist abuse at him. He was then kicked repeatedly before Lawrie came out of the pub and joined the attack. The victim briefly lost consciousness but was then able to crawl. He screamed at onlookers to ring the police but those witnessing the attack ignored his pleas. The driver eventually ran through the gardens of nearby homes and was eventually helped by someone who took him inside his home and blocked the entrance to prevent further attacks. Lawrie, of Monkhill Avenue, Pontefract, was arrested and said he had attacked the man after his 10-year-old daughter had gone into the pub and told him that a man had asked her to get into his car. He pleaded guilty to racially aggravated assault occasioning actual bodily harm. A month before the attack Lawrie had been made the subject of a community order for punching a man in the Malt Shovel pub, Pontefract. Sean Smith, mitigating, said Lawrie had overreacted to the information given to him by his daughter. Mr Walters said there was no evidence that the victim had behaved inappropriately and he had only been working for the fast food firm for five days before the incident. Lawrie was given an 18 month prison sentence, suspended for two years, and ordered to do 150 hours of unpaid work. Lawrie was also told to pay £500 compensation to the victim. Recorder Nigel Sangster, QC, said: “It is a matter of shame that so many people watched this. The people who did not help should be ashamed of their behaviour. THREE grandparents have been jailed for attacking a couple outside a pub – because they thought the male victim was Polish. Paul Clarke, Sean Pickerill and Judith Pickerill – all in their forties – took part in the assault on Slovakian Milan Panacek and his English girlfriend Genevieve Barnett during a night out in Newcastle. Stoke-on-Trent Crown Court heard tension had sparked between the male defendants and Mr Panacek because of the design of T-shirts they were wearing. 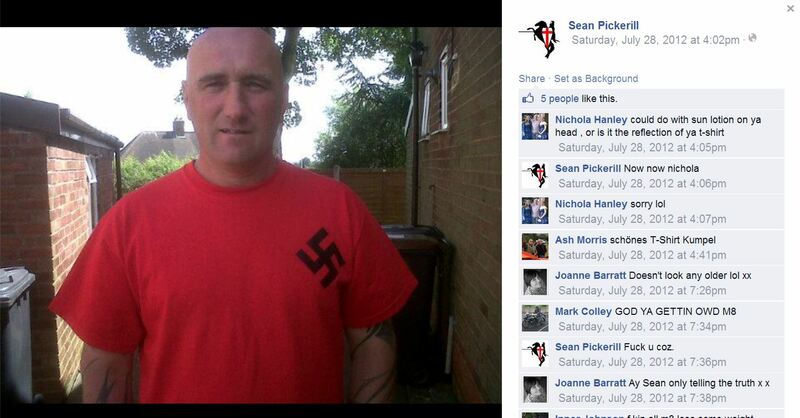 Sean Pickerill’s top bore the logo ‘Blood and Honour – England’, while Clarke’s had the brand ‘One True Saxon’. Mr Panacek’s shirt had a quote in Spanish relating to the country’s civil war. Following a disagreement on the dancefloor of The Rigger pub, Mr Panacek and Miss Barnett went outside where they were attacked by a group of around eight people, which included the defendants. Prosecutor Elizabeth Power said: “They were shouting racial abuse about Mr Panacek being Polish. “He tried to tell them he wasn’t Polish. “Judith Pickerill punched Miss Barnett and scratched her to the face. She pulled her backwards, pulling at her hair extensions. “She fell to the floor and hit her head on the pavement. Judith Pickerill, aged 45, of St Bernard’s Road, Newcastle, went on to assault the pub’s manager Robert Birchill. Father-of-three Sean Pickerill, aged 46, and Clarke were attacking Mr Panacek. Miss Power said witnesses described the group as ‘like a pack of animals’. The court heard Miss Barnett suffered injuries including concussion and whiplash, and suffered blackouts after the incident. Mr Panacek, who has lived in the UK for six years, had a fractured nose. All three defendants pleaded guilty to racially aggravated assault occasioning actually bodily harm. Judith Pickerill also admitted common assault. The court heard they all had previous convictions but had not been in trouble for a number of years. Marc Davies, representing Judith Pickerill and 47-year-old Clarke, also of St Bernard’s Road, said: “They are ashamed and very sorry. “These are two people that had been out of trouble for a long time, addressed any issues with drugs and settled down with families and full time employment.